Each track is a different, unique meditation. Filmed with the lush backdrop of the Kampong National Tropical Botanical Gardens, this yoga class features Beginner, Intermediate, and Advanced options, allowing you to grow in your practice at a pace that is comfortable for you. 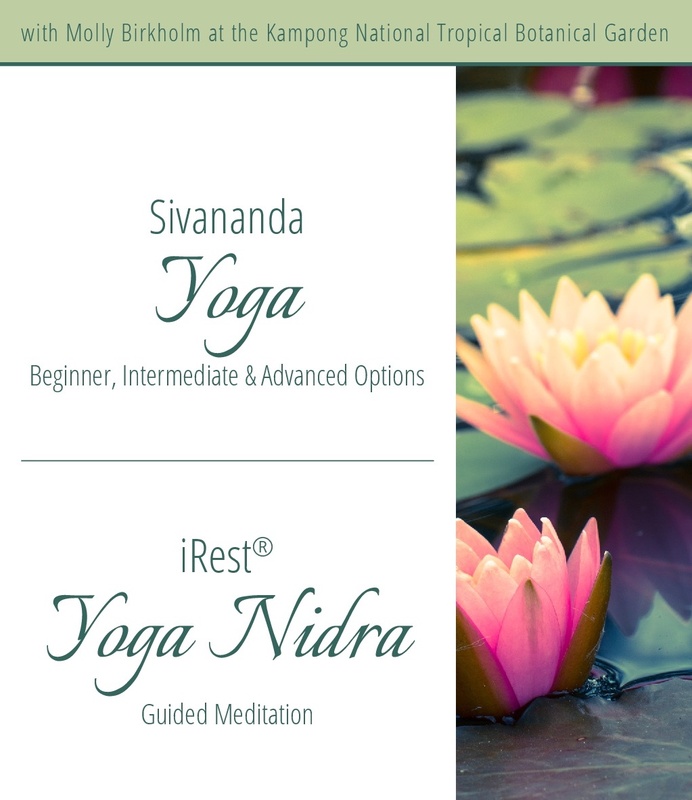 Viewers will experience a full Sivananda practice which includes pranayama (breathing exercises), sun salutations, and the classical hatha yoga asana sequence. Molly provides step-by-step instructions throughout the practices, and even breaks down the more challenging poses, like crow pose and headstand, to allow viewers the opportunity to expand their practice in a safe way. This practice can be done at your own pace and within your comfort level. The yoga class concludes with a relaxing and restful savasana (final relaxation pose). Also included on the DVD is an iRest Yoga Nidra practice, filmed under one of the largest Banyan Trees (one of the most sacred trees) in the United States. This guided mindfulness meditation is practiced lying down in a comfortable position. During the practice, you are guided through an experience of your physical body, the breath, feelings, emotions, beliefs, and out into deep states of rest and relaxation. It is the perfect follow up to your yoga practice and the ideal way relax.